In Outlook, you enjoy the mailbox attributes of storing tasks, calendars, to-do lists, notes, appointments, and journals etc, which are not there in Outlook Express. Your Outlook Express export to Outlook decision is quite right as you can see for yourself the many benefits of using Outlook 2010. Converting Outlook Express to Outlook is an effortless task if you choose an easy-to-use DBX to Outlook tool like DBX to Outlook Converter. 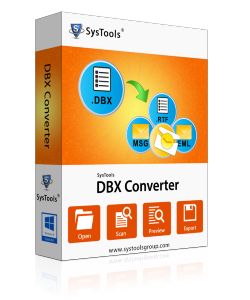 The process to convert DBX to PST using this software is easy even for a non-technical user, who manages toimport DBX emails to PST even without much technical support. However, if you face any doubts during the process to convert DBX to Outlook 2010, then to solve your doubts, we have a 24x7 support team. DBX to Outlook 2010 – Your Conversion Gateway! Benefits of Using Outlook 2010: Below mentioned are some benefits that you will avail after switching onto Outlook 2010. These will help you to take a closer look at what all features you will enjoy after changing your email client from OE to Outlook 2010. Prevent Add-in Resiliency: Generally, add-ins degrades Outlook performance or resiliency. To prevent this, Outlook now uses a new fast shutdown process. Better User Interface: After DBX to Outlook 2010 conversion, it is possible for you to customize areas of the User Interface, which were not extensible in previous Outlook versions. Provision for Multiple Exchange Accounts: You can now define multiple MS Exchange accounts under a single profile only. The application is now improved for handling multiple Exchange accounts.